We all have those buys which we really do regret, so here I have listed my worst buys of 2012. What do you regret buying last year? 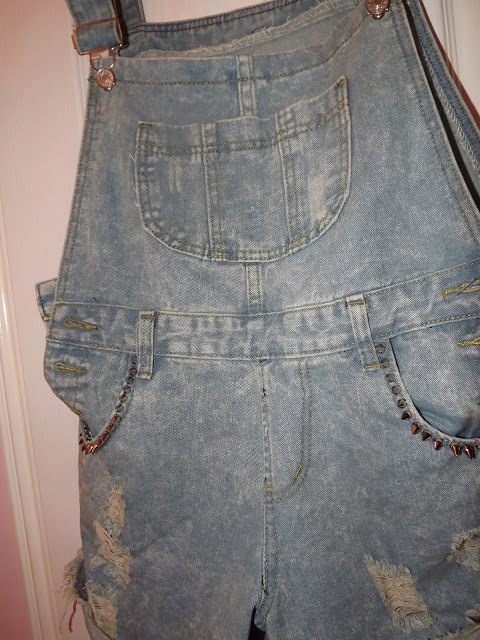 I was after dungarees for months and finally ordered some from eBay. My mum even helped me stud them all and even though I like the look of them, I just can’t face wearing them. When I see other fashion bloggers wearing them (Beauty Crush or Londons Closet) they look fantastic and I just can’t see myself pulling off the look! Hopefully I will finally wear them this summer, if I’m brave enough! Creeper duplicates seem so popular in the blogging sphere. I drooled over the ones above on eBay for months and they finally were reduced to £15 so I took the plunge. I was so excited when I got them and couldn’t wait to wear them. Since then I’ve worn them once. My Underground creepers are just so so comfortable and so well made compared to these, I feel I can’t wear them again! I think Underground creepers are definitely worth the money, you really do get the good quality you pay for! Although I wear a lot of bright things I found this too bright and feel a bit uncomfortable wearing them. I’m all for dupes, most things I own are duplicates of brands I can only dream of affording. I’ve wanted a pair of disco pants since 2011 but £70 is just too expensive (they have actually gone up to £74 now!) So I bought the above disco pants for £30 in the summer and oh my, they were awful! They weren’t very ‘shiny’, they rested on my hips not high waisted and they looked nothing like the AA pants! I haven’t tried any of the other dupes (Missguided, Boohoo, Glamorous) so maybe in the future I will but the Hearts & Bows pair I ordered from Ark Clothing definitely discouraged me! I was lucky to recieve a pair of AA disco pants as a present as although completely worth it, £70-4 for a pair of trousers does seem ludicrous. The JC copies have been on my wish list since January 2012 and when Primark finally started selling them I didn’t hesitate! I bought them in October and still haven’t worn them – I’m too scared! I mean if I fall over in normal heels how can I trust myself in these!? I think I’ll save them for 100% sober nights so I can take care of myself. I don’t want my £25 purchase going to waste! Luckily I received the web effect nail polish as a freebie with some Barry M polishes I bought. I really did expect it to look like an actual web effect not croc effect in orange!